I am quite adventurous when it comes to food, and like nothing better than walking the aisles of a Chinese grocer looking for something different. Sometimes this is spurred on more by my delight in the sheer lunacy of some of the foodstuffs than it is by the enjoyment of the foods themselves. I have also been a huge fan of packaged noodle soups since my university days when, out of desperation, time constraints and poverty, I used to buy them by the box. Well, I've just come across a remarkably strange noodle pack I thought I would share with you. The soup package pictured above is something extraordinary. The image is, at best, foreboding. A figure faces away from us, wrapped in a cloak, billows of steam issuing from some unseen volcanic vent. Barely visible is the edge of a bowl, lifted towards what we can only assume is a shrouded face. From this one must decipher as best one can what might be inside. Opening the wrapper reveals a hockey-puck sized disc of dried noodles accompanied by not one, but three packages of flavouring. The first is the usual powdered flavour pack, containing MSG plus whatever else the manufacturer deems worthy to turn water into broth. This is augmented by a second containing a thick paste. Finally there is a transparent package of dried white peas, soybeans, or something similar. As this stewed in boiling water I was reminded of the film I'd just watched, the flawed but nonetheless intriguing The Brothers Grimm. With this in mind I named the spicy and thoroughly peculiar flavour "Terry Gilliam". I may as well, since the only English on the package was the less than helpful label "Baijia". The ingredients are incomprehensible, though a sticker helpfully translates them into Dutch. However, a web address was provided, so I could do additional research. Or at least I tried. The site hides itself, flashing a home page and then saying "This site is in building..." before going almost blank. However, a link leads to a temporary site, or the new one, I'm not sure. From this I discovered that the flavour I had purchased was Spicy Fei-Chang Flavor. Spicy it was too, but no further info on the flavours was forthcoming, though they are based on Szechuan cuisine. There is a description of the company's manufacturing facility, which starts its process with the "rude sweet potato" and ends up with instant sweet potato noodle soup. If you keep reading you will be assaulted by the phrase "sweet potato noodle" every second or two. We take the lead in adopting the technique of "Freezing and Aging", changed the "hundred year's problem" of sweet potato noodle industry. 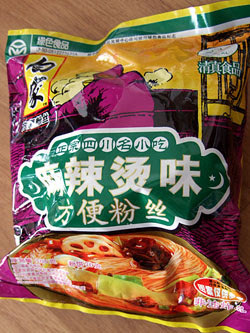 Indeed, I have no doubt that these noodles can last one hundred years, especially the Pickled Cabbage Fish Flavor. In the current political climate they may have trouble with Islamic Hot and Spicy Flavor -- perhaps this is why they label only in Cantonese? My favourite name has to be the Single Noble Dark Chicken and Delicacy from Mountain Flavor, which I hope to try if I can. But what did I think of the noodles in hand? I must say that sweet potato based noodles are not likely to be a favourite if you are used to those made of rice or egg. They have a totally different consistency, sticking together in a more glutinous manner while at the same time being more toothsome. I enjoyed the heavy spiced flavour but would have a difficult time recommending it to others who might prefer a lighter broth they can augment themselves. Certainly this is a singular noodle experience and not one to be missed by those bored of your standard ramen or udon fare. Please let me in on some of your favourites in the comments!